The public launch meeting of Islington Unite Against Fascism was a wonderful example of British multiculturalism at its best. The Finsbury Park Mosque ,where the meeting was held, was buzzing with men, women and children from all religions, cultures and backgrounds, united in one aim: to defend multiculturalism and fight fascism. Even the panel of speakers represented the diversity of the borough, from religious leadersto MP’s to national campaigners. The room was packed, estimated 180 in attendance, with people even having to stand at the back. Chairing the meeting was Mark Campbell, a senior lecturer at London Metropolitan University and chair of London Met UCU branch. A life-long anti-racist campaigner, Mark began the meeting with Pastor Martin Niemoller’s famous poem “Never Again” and dedicated the meeting to the victims of the Holocaust in reference to Holocaust remembrance day that week. 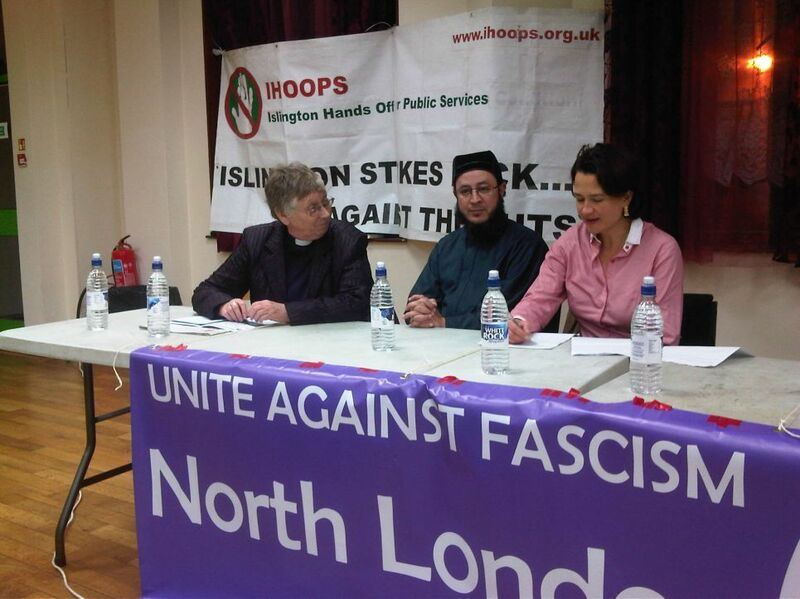 Speakers included Catherine West, Leader of Islington Council, who spoke about housing problems in the borough, then Imam Ahmed Saad, who talked about the history of Islam and anti-fascism. Islington MP Jeremy Corbyn spoke next on anti-fascismin Islington and how the borough has a long history of challenging racism and defending itself against far right groups like the National Front and the BNP. Reverend Jennifer Potter, leader of the Islington Inter-faith Forum spoke of Celebrating our diversity and being open minded in our approach to others and working as a community to build friendships between different faiths and cultures. Hassan Mahamadallie, editor of the book Defending Multiculturalism, spoke of his experiences of racism and the link between the fight against fascism and racism and the fight against government austerity. Emily Thornberry, Islington MP, spoke of her history working with refugees and immigrants as a lawyer and how this shaped her approach to politics in the borough. And finally, Weyman Bennett, joint national secretary of Unite Against Fascism, spoke of the national situation in terms of far right organisations and our responses to that. These speakers were followed by many questions, comments and most interestingly, personal stories. People spoke of their own struggles and problems they have faced in the community, as well as asking for a better channel of communication between the MPs and their communities. And as a final triumph of the evening, the whole event was broadcast live, via Skype, from the mosque to the FinFuture community space across the street for the benefit of disabled people and their carers. In all, this event has truly united the community in one aim: to Celebrate diversity, defend multiculturalism and oppose Islamophobia and racism. It has also opened up the dialogue between different corners of the community, creating a space for everyone to tell their story, have their voices heard and to come together in Islington, galvanized in unity and strength.